Flying Salsa was a short-lived burrito joint on the corner of S. Evans St. and E. 5th St. in Greenville. They hosted quite a few shows, and those of us in bands lucky enough to play there were fed Mexican food and beer to our heart’s content and always left with some extra spending money in our pockets. 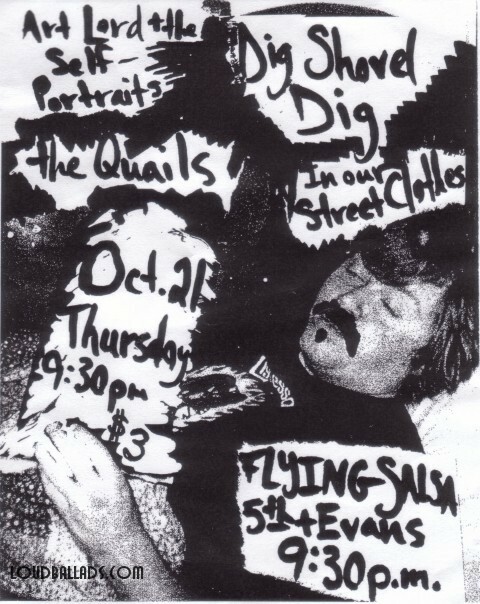 The Quails was a short-lived name. Soon after this show, they changed their moniker to The Capulets. After The Capulets broke up, Stu McLamb started The Love Language and Josh Pope started The Light Pines (and then after that, recorded songs as Cocoon). Enter your email address to follow Loud Ballads and receive notifications of new posts by email. All original content Copyright Loud Ballads 2014-2018.